Remember coin-op classics such as Smash TV, Mercs and of course Commando? Well, Wolf of the Battlefield runs along the same lines. Charge across top-down battlefields rescuing prisoners and laying waste to an army of insurgents using those tried and tested dual analog stick controls. 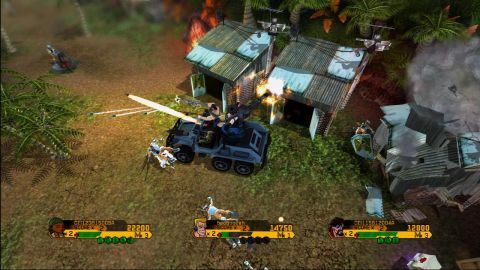 In co-operative three-player this is a nostalgic blast, but single-players will grow bored quickly despite a wealth of weapons, vehicles and bosses. Description As a follow-up to the arcade shooters back in the '80s, this top-down blaster delievers some cheap thrills and explosions but little else.